Decommissioned Navy sub named top 5 "boatel"
You are at:Home»Navy»Decommissioned Navy sub named top 5 "boatel"
Though the Navy isn’t known for its luxurious accommodations, the WWII submarine Silversides was just named one of the top five “boatels” by CNN Travel. A “boatel,” or boat and hotel, allows visitors to have the comforts of being on dry land and the adventure of spending the night at sea. Silversides, a Gato-class sub that earned 12 battle stars during WWII, is in Muskegon, Mich. It was slated for the scrapyard, but was saved when a group of former Navy personnel towed it to the Muskegon Channel in 1987, CNN reported. A night on the ship lets visitors “experience life as a World War II sailor — without the combat,” the CNN story said, though the sub saw plenty of the latter, sinking 23 Japanese vessels during its service. The sub boasts 72 bunks and hosts a lot of Boy Scout troops and school groups, its website said. 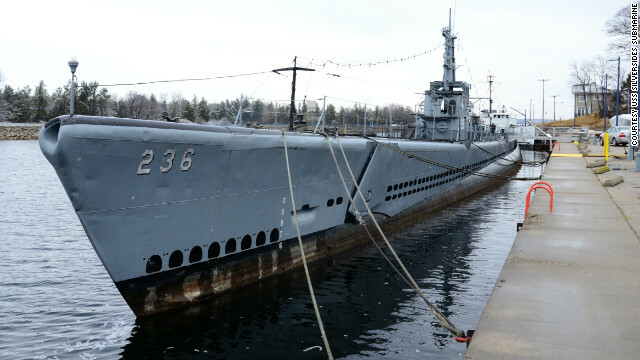 Overnight visitors also have the chance to visit the submarine’s museum and tour the Silversides, as well as participate in workshops on Morse code, knot-tying and building remote controlled underwater robots, Michigan Live reported. Spent two years shore duty in Chicago ’60 and ’61. Spent a lot of time on board during the weeks and had cold, lonely and Eire nights alone knowing the history of her. Was proud to help keep her clean and was the best duty of my 20 years. Only bunk was in the after battery for duty man. Officers quarters bunks were still intact. Galley had two tables. How was the diesel smell handled ?